Freeze Tag is an outdoor game for a group of kids. Like a regular tagging game, one player is 'it' and the other players run around trying not to let that player catch them. In this version, players also work as a team to try to foil the tagger. When they're tagged, they freeze and go out of the game until someone melts them and puts them back in play. Games can be informal, with kids deciding how they play and how long games last. If you want to be a bit more organized, you can time games and set different rules. 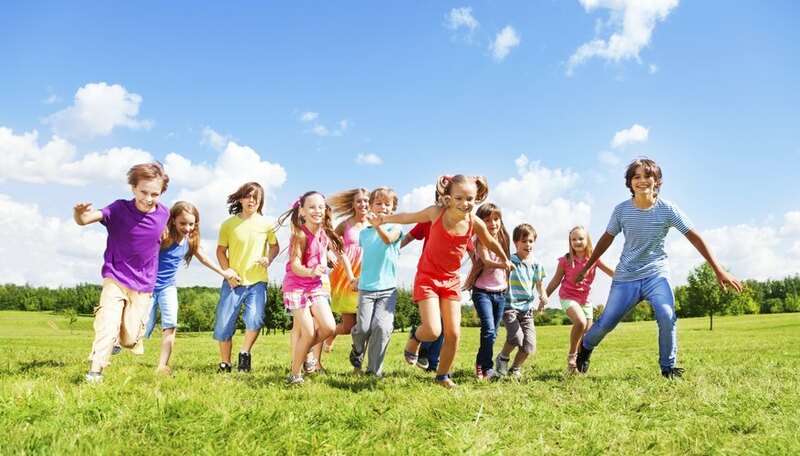 All you need to play Freeze Tag is some open space and a group of kids. It's worth setting boundaries to contain the game -- and the players -- into a specific space. The field of play should be big enough for players to run around and evade capture but small enough to give the child who is 'it' a fighting chance. Before you start, talk to the kids about safe tagging -- they shouldn't push, shove or slap other people. Pick one child to be 'it." When you're ready to start, tell the group to scatter and have the child who is 'it' count to five before chasing after them. The aim of the game for the child who is 'it' is to tag as many players as possible. When he tags players, they freeze in place and are temporarily out of the game. The rest of the group runs round to avoid being tagged and works together to unfreeze other team members. Players melt frozen kids by tagging any part of their bodies or by giving them a high-five. It's worth making a rule that the player who is 'it' cannot hang around waiting to tag when someone is trying to unfreeze a frozen player. If you're playing to win or scoring the game, set a time limit. If the child who is 'it' freezes all players within the allotted time, he wins; if not, the team wins. If you have a lot of kids and a large space, the player who is 'it' may get frustrated and exhausted pretty fast. It helps to add another 'it' so the pair can work as a team. Alternatively, make it harder to unfreeze people by making kids melt players by crawling through their legs. To mix things up, set a rule that a player who is frozen three times becomes 'it,' allowing the original player to switch to a team role. You can also play a shorter version of the game by making a freeze tag permanent. If you're playing competitively with a large group, it can be hard for the child who is 'it' to win. You can even things up by giving a point to 'it' for every frozen player and a point to the team for every free player at the end of the game. Everybody's It is similar to Freeze Tag, but all of the kids tag and freeze other players. When a player is frozen, she must wait to melt until someone else tags the player who tagged her. Kids often find Toilet Tag fun to play. The rules are the same as Freeze Tag but, when a player is frozen, she goes down on one knee and holds her arm out to the side. To unfreeze her, another player must sit on her knee and move her arm down to flush the toilet. In Chain Freeze Tag, players unfreeze players by holding their hands. They then have to run together in a chain, gathering other frozen players as they go. If the child who is 'it' tags any child in the chain, the whole chain freezes until a free player can grab the hand of a child at either end.